The Idiot’s Tale: Signifying What, Exactly? When it comes to playing the role of an idiot, Donald Trump, Jr. is certainly no Prince Myshkin. He doesn’t even rise to the level of Faulkner’s Benjy Compson. Still, it may be possible to squeeze out a little bit of empathy for the man-child of Park Avenue. 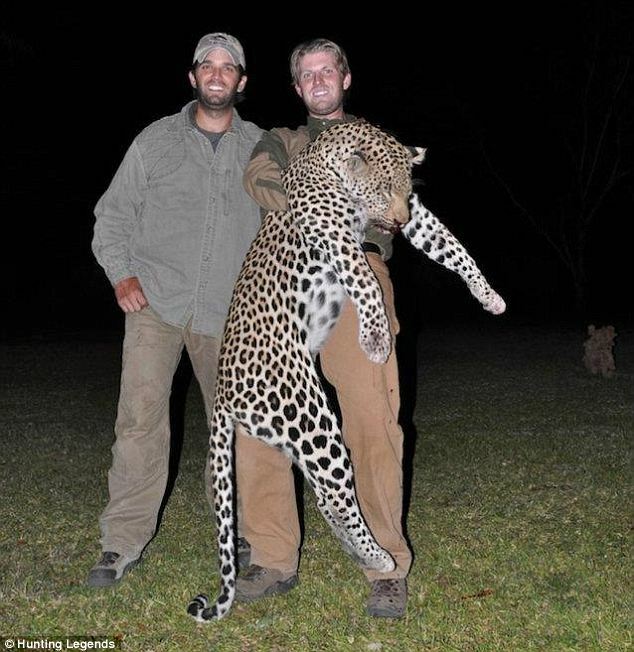 Yes, I know, in most respects Micro-Donald is an utterly unappetizing specimen of humanity, who flies around the planet slaughtering rare species (such as this endangered leopard) for bloody selfies. But the boy is the progeny of Donald Trump and who among us would want to endure the torments of that brand of child-rearing? By all accounts, Trump’s parenting skills were stern, cold and brutal. There were no games of catch in Central Park, no camping trips to the Adirondacks, no help with homework. For most of Donnie’s childhood, he rarely saw his father or mother. He was nurtured by Irish nannies and Ivana’s mother and then shipped off to The Hill, a boarding school for the children of elites in Potsdown, Pennsylvania. Don’s sister Ivanka, whom Trump seems smitten by, described what it was like when Daddy decided to play his satyr-like pranks with the kids, often on the ski slopes in Aspen. “We were sort of bred to be competitive,” Ivanka recalled. “Dad encourages it. I remember skiing with him and we were racing. I was ahead, and he reached his ski pole out and pulled me back.” But for the grace of Odin, Ivanka, Eric and Don could have ended up as slopekill like that other wayward scion Michael Kennedy. When Micro-Donald was twelve, he had to endure the tabloid spectacle of his father excoriating his mother, Ivana, in the press, while squiring the Georgia beauty queen Marla Maples. Later, he learned that his mother had accused his father of sexually assaulting her (an accusation later withdrawn as part of a legal settlement.) For years afterwards, the son kept himself at a chilly distance from his despotic father. Many children raised in similarly frigid circumstances development so-called “attachment disorders” and end up torturing animals. Donald Jr. started killing them. Then when young Donald followed his father’s footsteps to the Wharton School of Business at the University of Pennsylvania, a thawing in relations ensued. Sadly, this familial warming proved more of a short-term heat spell rather than a true change in climate. According to an account from Micro-Donald’s dorm-mate, a man called Scott Melker, there came a time when word spread through the dorm that Donald Trump himself would be visiting to take his son to a Yankees game. Many of the dorm’s residents crowded together near young Donald’s room to catch a glimpse of the tycoon. His friends noticed a change in Donnie after that brutal interaction with good old dad. He started drowning his shame with booze and fed his gnawing rage by blasting away at ungulates and predators. After graduation, Micro-Donald drifted away from Manhattan to Colorado, where he worked for some time as a bartender. In 20o1, he was busted for public drunkenness in New Orleans. For the next few years, Micro-Donald toiled in the anterooms of Trump Tower working on minor real estate deals, making occasional appearances on “The Apprentice,” trying to please Daddy by playing golf more than fishing, and learning how to dress for success. It was during this training period that father introduced son to the woman who would become Donnie’s wife, the blonde model and beauty contestant Vanessa Kay Haydon. The Made-for-Reality-TV couple was married in 2005 at Mar-a-Lago. By that time, Micro-Donald had made at least six trips to Russia, negotiating deals ranging from the promotion of Trump Super Premium Vodka to a failed Russian reality show starring a mixed martial arts fighter. Quality stuff. He made his first expedition to Russia in 2006, where he was introduced to Russian oligarchs by Felix Sater, a Russian-born real estate magnate and Trump business associate. Among the Russian bigwigs Junior met on that maiden trip was Aras Agalarov, the Moscow construction kingpin and father of pop star Emin Agalarov, represented by the rotund impresario Rod Goldstone. All of this is by way of saying that Don Jr. had much more experience in Russia than his father. He knows the lay of the land, the players and the politics. It was Don Jr. who arranged the Miss Universe contest in Moscow in 2013 and tried to negotiated a deal to build a new Trump tower in the Russian capital, alas another doomed venture. In other words, Little Donny might be an idiot, but he is not a naive idiot. Not about deal-making in Russia, anyway. So what was going through Micro-Don’s mind when he saw the subject heading in Rod Goldstone’s email: “Russia – Clinton – private and confidential.” Was there a flash of excitement? Did he say to himself? Now I might have something that will really impress him, something that might elevate me in his esteem above that nosy Jared, his sibling-in-law rival? Or as he read deeper into the message, and absorbed the explicit, almost too explicit, offer from an emissary of the Russian Government of “documents and information that would incriminate Hillary,” did some other notion begin to form in his subconscious? When Don Jr. agreed to the fateful meeting in Trump Tower with a Moscow lawyer with tenuous ties to the Kremlin and a former Russian military intelligence officer bearing gifts and decided to rope Paul Manafort and Jared Kushner into it, did he think he had finally found the ticket to an improbable victory for his father? Or did some other motive begin to percolate in the Oedipal depths of his psyche, tempting him with the idea that in one wild stroke he could sow the seeds for the future fall of the house of Trump? As attractive as that notion is in a literary sense, such a revenge play authored by Jr. is also improbable. The hubris of the Trump family is surpassed only by their stupidity. As a brood, they are too dumb for Greek tragedy. + Trump in Paris on Bastille Day? Where’s Robespierre when you need him? To defend the oppressed against their oppressors, to plead the cause of the weak against the strong who exploit and crush them, this is the duty of all hearts that have not been spoiled by egoism and corruption… It is so sweet to devote oneself to one’s fellows that I do not know how there can be so many unfortunates still without support or defenders. As for me, my life’s task will be to help those who suffer and to pursue through my avenging speech those who take pleasure in the pain of others. How happy I will be if my feeble efforts are crowned with success and if, at the price of my devotion and sacrifices, my reputation is not tarnished by the crimes of the oppressors I will fight. + The GOP response to Mini-Donald’s smoking email chain reminds me of the party’s response to the Presidential Daily Briefing presented to Bush a month prior to 9/11 titled: “Bin Laden Determined to Strike in US.” It didn’t say when, how, where, why or the exact time of day, did it….? + Squint your eyes and scan the map for the patches of yellow. Those represent the counties where minimum-wage workers might be able to afford an apartment. + A new poll suggests that 73 percent of Democrats would give up drinking in order to witness the impeachment of Donald Trump. Now this might lower the cost of alcohol for the rest of us, but it’s not enough. If they would pledge to give up eating, we might have a deal–though they would be required to sign a DNR order. + In 2016, more than 200 environmental activists were murdered around the globe, many of them indigenous people trying to defend their villages, forests and rivers from mining, timber and oil companies. It’s the deadliest year on record for defenders of the planet. + Too bad one of the Evangelicals who assembled in the Oval Office to lay their hands upon Trump didn’t bring a rattlesnake to test the resolve of his faith. + Aramis Alaya was the first African-American to be elected as a state attorney in Florida. This week a video emerged of her being racially profiled by Orlando cops, stopped and interrogated for no apparent reason other than that she was a black woman driving an expensive-looking car. The cops only back off after Alaya showed them her ID. How many times a day do these stops happen across America 100? 1000? 5,000? + The Kremlin this week proposed recruiting Henry Kissinger to act as a mediator between Trump and Putin. In carving up the world to suit American interests, Kissinger has always favored an alliance with Russia over China. Did Moscow Center clear this initiative with the ghosts of Ho Chi Minh and Salvador Allende….? + The elites will never forgive Lula, who was convicted this week in Brazil on politically-driven charges of corruption in office. At least they didn’t assassinate him…yet. + A new study shows yet again that closing medical marijuana dispensaries actually increases local crime rates. But the war on drugs goes on, impervious to facts, logic and reason…. + The senator from Citibank, Chuck Schumer, is calling for a war on snortable chocolate. If this takes the shape of other Democratic Party-launched “drug” wars it’s possible predict the sentences: Eat it: Chuck will call you for a donation; Snort it: get 1 to 5; Smoke it: get 15 to life. + Rep. Steve King, the reliable geyser of bile from Iowa, proposed this week that construction of Trump’s border wall should financed from the money saved by eliminating funding for Planned Parenthood and Food Stamps. Does he come up with these quips in church? + If we are going to remove Confederate monuments from the public sphere, can someone please aim a wrecking ball at Jefferson B. Sessions? + This week the New York Times published a demeaning column by David Brooks titled “We are Ruining America.” If I had been the headline writer for the NYT op-ed page, I’d have titled the column “How David Brooks is Ruining America.” The toxic off-gassing from each of his ponderous scribblings despoils a few more precious acres of the Republic. + In 1960, JFK won 70 percent of the vote in King County, Texas, home of the town of Guthrie, which has a degree of international fame from being a locale in Jack Kerouac’s On the Road. In 2016, Hillary Clinton managed to convince only five voters in the entire county to cast their ballots for her. No Russians in sight. + On Sunday, Army vet name Justin Walters shot his wife in upper state New York and then opened fire when police arrived at the scene, killing NY state trooper Joel Davis. Walters was arrested and is now in custody, facing two charges of murder. Blacks and Hispanics rarely survive those kinds of encounters. White men are the top killers of American police, yet, they are almost always taken alive. From 1980 to 2013, there 2,269 officers were slain in non-traffic related incidents. The 52 percent of the killers were white, and 41 percent were black. + The White House transcripts of Trump’s speech before the G-20 referred Chinese President Xi Jinping as the leader of Taiwan. Worse, Trump persists in calling him President Eleven. + Time to go Radioheadless…. + Sen. Orrin Hatch: “Had we not had the filibuster…this country would have gone straight to socialism.” Time for the nuclear option, Mitch!